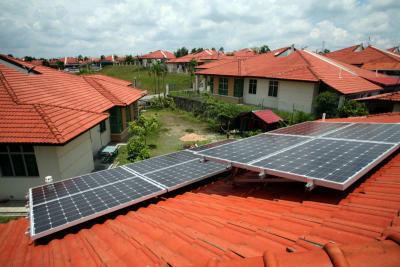 Powering Malacca With Solar Powered Rooftops. Malacca aims to be ‘The Green State” by year 2020 and it is not a surprised to see a company like Green Earth Design Solution Sdn. Bhd. plan to have every rooftop in Malaysia to be covered with solar photovoltaic (PV) panels to generate electricity. And if everything goes as planned, they will have all the rooftops in Taman Rembia Perkasa, Alor Gajah, Malacca, covered with electricity-generating solar cells, creating the country’s first community solar project. The best part of this project is that, with no money down and maintenance free, you would be getting RM100 each month from GEDS for the next 11 years. After the 11 year contract, you could expect to enjoy around RM600 a month of income from the solar PV installation. Although you might say RM100 is peanuts, but considering the facts that the cost of installing a typical 5kWp system in each home is at least RM50,000. A company is installing solar cells on rooftops, then sharing proceeds from the electricity sale with the houseowners. If Dr Nurul Muiz Murad has his way, every rooftop in Malaysia will be covered with solar photovoltaic (PV) panels to generate electricity. Why not, considering that Malaysia enjoys relatively long hours of daylight, and there are lots of rooftops with no conceivable use other than to keep the elements out. His dream will be partly realised in baby steps, starting this month, when 10 houses in Taman Rembia Perkasa in Alor Gajah, Malacca, are fitted with PV panels. He hopes that these early adopters will help convince at least 400 homeowners in the residential area located some 20km away from the Malacca town centre, to do likewise. Muiz is the principal of Green Earth Design Solution (GEDS), the company given the exclusive right to implement the project by the Malacca state government. If successful, as far as individually-owned roof-mounted PV systems are concerned, the endeavour at Rembia Perkasa will be a model for the rest of the country to follow. The five-year-old township is a mix of 645 terrace, semi-detached and bungalow homes and houses predominantly middle to upper middle income residents. Currently, close to 100 households have expressed interest to be a part of what is known as Taman Rembia Perkasa “rent-a-roof” solar scheme. When these applications are approved by the Sustainable Energy Development Authority (Seda, which regulates all renewable energy installations), GEDS will start installing the PV systems, with the eventual aim of doing up 400 houses by August.